I never left the ground until I was married. Flying was something exotic when I was growing up, at least to us, so all of our family vacations took place within a few hours' drive of home. And really, there were only two choices: The Catskill Mountains and The Jersey Shore. Either way, we vacationed with Armenians. The Shore was my preferred destination because more of those Armenians were kids. And what kid doesn't love the beach? Our beach was in Belmar, a little south of better-known Asbury Park, and the spot where I was sure to find playmates was the Shamlians' house. Rose Shamlian was my mother's cousin. She was married to Aram, son of the musician/composer Hovsep Shamlian, whose recordings were very much part of the soundtrack of my childhood. There was always a crowd in the cool shade of the Shamlian's front porch, ranging from kid-cousins of various ages to the matriarch of the clan, Rose's mother. Baidzar Doramajian occupies an honored place among our Great Armenian Chefs (see below) because she taught my mother how to cook. But my most vivid food memory of those times is entirely visual. We stopped by one day as the Shamlian boys, avid fishermen, were returning with the day's catch, which they immediately set to sorting, cleaning and cooking. I remember being mesmerized by the sight of crabs glowing brilliant red as they were hauled out of boiling water. The crowd on the porch grew over the years as the Shamlian boys started their own families. Now one of those kids is sharing his own recollections of that porch as part of a memoir about his life as a professional chef. 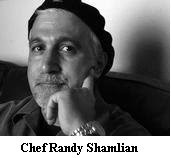 Randy Shamlian's culinary memoir, A Slice of Apple Pie, recounts his experiences from his youth in New Jersey to life as a pastry chef in various restaurants and as a business owner. But it isn't all sugar and cream. For all the romance attached the word "chef" these days, Randy paints a startlingly realistic picture of exhausting labor, intense pressure and even more intense professional conflicts. Nicely done, Randy -- although it left me far more interested in eating a pie than baking one. Randy's now a full-time writer based in Albuquerque, N.M. But while Randy has left the restaurant business, he hasn't left the kitchen. Check out his blog for many interesting recipes as well as news of his further adventures. I'll take the pie rather than bake it, too. Until all this "Top Chef" stuff I didn't realize cooking was such a sword and dagger affair. I figured the worst thing that could happen to a chef was heat exhaustion from working over a stove. I love this blog for the stories it contains and cooking mysteries it reveals. But, ultimately, if I have to work and worry it's not going to be about food. If the hard stuff is so great, why does a peanut butter and jelly sandwich taste so good?